Power. Wealth. Lust. Secrets. Corruption. Deceit. Revenge. It all hits an unprecedented new peak in the sensational, series-ending season of the hit drama from producer Aaron Spelling and creators Richard and Esther Shapiro. Golden Globe® winners John Forsythe, Joan Collins, and Linda Evans lead the spectacular cast, as a decades-old murder mystery opens up uncharted realms of deadly secrets and shocking revelations, with devastating consequences for all. Skeletons are discovered in the mansion walls, a priceless treasure is unearthed, and everything is pushing to a final, fatal conclusion. In Dynasty's last, legendary season, there's no end to the riches to be experienced. 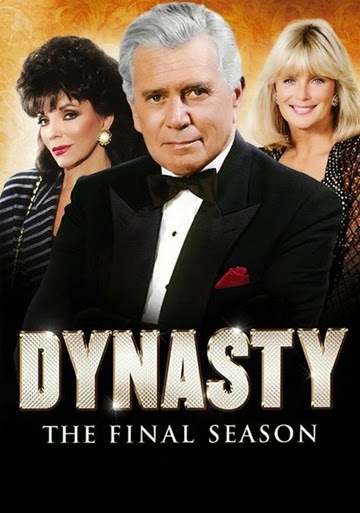 September 9th sees the 9th and last season come to DVD with the CBS/Paramount releases of Dynasty - The Final Season, Volume 1 AND Dynasty - The Final Season, Volume 2 as well. Each 3-disc set comes with 11 episodes that include Stephanie Beacham rejoining the cast, playing Sable, and Tracy Scoggins reprising her role from The Colby's spinoff as Monica, Sable's daughter. You can buy these half-season sets individually, or together as a shrinkwrapped bundle. Clink your champagne glasses one more time, remember the rich and the richest!